I haven’t posted earlier for two reasons – first, there’s still a lot of information and insight coming out of the investigation in Arizona. Second, the pace of rapid fire punditry was somewhat overwhelming. At a certain point, while people are still in surgery, I don’t really care to be arguing with conservatives on Twitter about the level of their leaders’ culpability for their persistently violent rhetoric in opposition to the Obama administration and Democratic policy pursuits. The press and public figures may not be willing to admit it, but violence has been a hallmark of American politics since our country’s inception. While over the course of our history violence has been perpetrated to further political means by both sides of the political spectrum, over the last hundred years (at least) conservatives have been far more likely to use violence as a means of political expression. From the Oklahoma City bombing to the murder and lynching of countless civil rights activists (or random African-Americans) during the Civil Rights era, the American right has a real, terrifying history of using violence. It is this history that makes the comments by Republican figureheads like Sarah Palin, Glenn Beck, Sharron Angle and Michele Bachmann so dangerous. The rhetoric exists in a historical context that is marred by violence. In many regards, the violent rhetoric that we see realized in Tucson started with President Obama’s inauguration and the legislative process of reforming health care. The August 2009 recess was defined by the frequent disruptions of town hall discussions by Tea Party radicals. Many town halls were canceled because of threats made against legislators. The threats weren’t solely directed at people making policy – many organizations that supported the President and reform, including my own labor union – were inundated with threats of violence from conservatives. One Glenn Beck viewer became so inspired by Beck’s smears of the non-profit Tides Foundation that he took up arms and drove to Oakland to try to kill them all, only to end up in a fire fight with the police. A lot has been made that Rep. Gifford was one of the Democrats literally put in the crosshairs by Sarah Palin’s PAC. 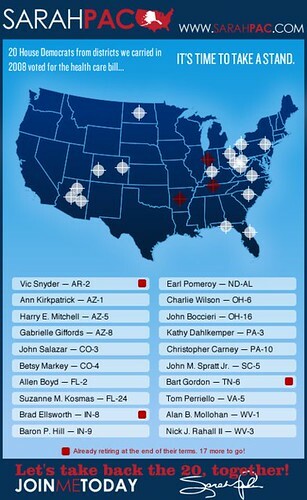 Gifford herself thought that it was provocative and dangerous, telling MSNBC “they’ve gotta realize there are consequences to that action.” Of course, Palin and her staff immediately tried to scrub references to the target map after the shooting. One spokesperson even went so far as to suggest the scope crosshairs were not even targets. In fact, she said that the “target list” was not intended to allude to guns. “We never ever, ever intended it to be gun sights,” she said. There is “nothing irresponsible about our graphic,” she said. As I said, I can’t think of a more dishonest, outrageous statement in recent political history than Palin’s spokesperson saying these were surveyor marks and not bullseye targets. If they were in fact a surveyor or mapping symbol, then Palin would not refer them to as “bullseye icon[s]” and her staff would not be scrubbing the internet of that image and those tweets. Beyond this, Dave Weigel points out that Palin repeatedly doubled down on the target map throughout the 2010 campaign. Any suggestion to the contrary is completely ludicrous. The fact that we are even in a position where the leading public figure of one political party has to deny that her words and her imagery actually encouraged violence is a testament to how outlandish Palin’s rhetoric was to begin with. But as bad as she has been, she is hardly the sole perpetrator of violent rhetoric on the right. It is disturbingly ubiquitous from leaders on the right, especially as the Tea Party has risen as a power base within the GOP. Something is deeply wrong when the language of violence is used to create enthusiasm for one political party, due to unhappiness with the previous results at the ballot box. When words like traitor, socialist, fascist, and communist are tossed around as needs for Republicans to “take our country back” and use “Second Amendment remedies” to achieve their goals, it is not shocking that some of their followers eventually do take up arms. “It’s time to do a little soul searching about the rhetoric we hear on the radio, how are children are being raised,” the sheriff said. Republicans are calling for Sheriff Dupnik to resign over these comments, citing fears that they will prompt violence against the right. This would be remarkable if it weren’t entirely within the playbook of the modern Republican Party – attack your opponent where you are most weak. There is still a tremendous amount of information that will come out about the motives of John Loughner. There is no scenario wherein someone takes a gun into a crowded political event and starts shooting that doesn’t involve them being mentally sick. But putting a gun to the head of a congresswoman point-black and pulling the trigger is an inherently political act. Regardless of what the final answer, if one emerges, about Loughner’s motivations, there is simply no reason for leading Republicans and media figures not to follow Sheriff Dupnik’s advice and do their own soul searching and tone down their rhetoric.